Players who have explored the depths of Velious already know that crafters have a bigger role to play this expansion than in many years. In addition to saving players time and money, in Destiny of Velious, tradeskillers are integral to transforming raw materials looted in cellars, caves, and other dark places into the shiny new armament that players actually want. Although most of this information has been posted on other websites, it hasn’t all been available in a single organized article, so that’s what I’ve set out to do here. We cover the biggest purveyors of armor and weapons in Velious — Thurgadin, Ry’Gorr, and Drunder — who via faction and crafter recipes offer a full selection of armor, jewelry, cloaks, charms, and weapons. The one thing excluded from Thurgadin, Ry’Gorr, and Drunder armor sets is Chest items. Fortunately, we have a Guide to Destiny of Velious Chest armor that covers those choices and where they drop. Crafters: Before going any further, if you haven’t already explored Niami Denmother‘s EQ2Traders website, specifically her Special Armor guide, I highly suggest it. This article also owes its history to an article posted by Whilhelmina shortly after Velious launched. 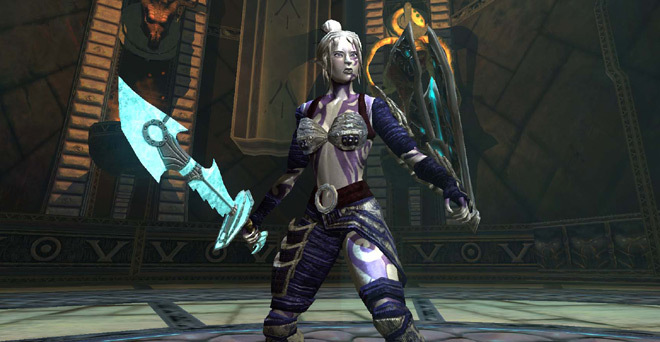 On October 11, 2011, Primal Velium Shards were removed as a primary component from Thurgadin and Ry’Gorr armor. Also Drunder armor pieces now drop within Drunder zones. As a result, crafting Drunder armor is now optional and reserved for those with particularly bad luck. Fortunately for them, the materials used to make Drunder armor have been made much more prevalent. This guide has been updated to reflect these changes. This is a multi-page article so please use the navigation below to select a section. Great article. The whole DoV shard armor was really confusing me with the different factors, and this article has been of great help to me. Thanks. May I borrow and translate it? This is awesome! Thanks for the write-up. I was really strugling in finding decent info about the various armors and required mats. this is a pretty awesome right up. i haven’t seen pics of the new gear yet, it would be nice if i could view the new drunder geat juxtaposed against ry’gorr gear. I may add another page with just some examples of the gear progression. I could do an example or two of the same item in Thurgadin, Ry’Gorr, and Drunder armor. Then I could do a few examples of the same item in the 4 patterns of jewelry/cloaks. The items are virtually identical except for stats going up about 8-10% per tier. Heya Feldon, really nice guide, but two informartion are false. 1. Needed Shards on Vendor for Rygor Shard Gear are 52, not 47. And Rough Gems are not dropping in all Velious Dungeon ( not drunder), only in Kael 1-3 and Kael Contested. also only in those four instances. Thanks I’ve made the corrections. So Chest piece can’t be crafted is boss drop. ToRZ ranger BP is Ry’gorr BP chest (Lacerating). Drunder ToT ranger BP from last boss is from drunder crafted set (Primeval). When you see people asking drunder too to get a bump in stats it’s serious. As you can see the New best BP from hardest normal heroic zone is less good than previous tier. It’s even in some ways less good than Fortress spire chest (no proc). Aspect of War is fully bugged yet. Can’t adorn white adornment Multiattack on bow, shield don’t have appearence, some items are droppable some are heirloom. About Thurgadin armor it’s a big rip off, they cost more than ry’gorr for a really useless stuff. Never buy this crap, rare gems are really common and cheap. And the focus on gear is great. Thurgadin should have been 20 token for each piece no more, considering it’s junk compared to ry’gorr. And dont talk about fabled drop from ToFS, Velk, Kael sold at 300 token, even at 100 token it’s overpriced compared to what they give. In SF an item for 120 was fair due to special focus on it. But 300 token of even 100 token for a blank item with nothing on it, it’s a rip off. Should be 50 token max. Thanks for the excellent write up Feldon! I have that book and don’t see any jewelry in it. Which jewelry items am I overlooking? You’re right, no jewelry or anything in volume ii. I thought we could craft the other Ry’Gorr vendor stuff for 150 and 300 shards but guess not. I’ve stripped out all mention of jewelry in the crafted armor descriptions. Drunder armor does have a big advantage in two slots: it adds the raid-level focus effects onto the helm and shoulder slots, in addition to the forearms, gloves, and boots. Ry’Gorr armor has focus effects on forearms, gloves, and boots only. Legs and chest only get a focus effect at the raid level, I believe; I need to double-check the Drunder x2 stuff. And voilà, finally finished translating this in French. Thank you once more Feldon. Hey Feldon, mind if we link to your site/guide as it would be a fantastic resource for our guild. Thanks for considering! (note for followup purposes we have created the link but will remove it if we 1. don’t get a response, 2. get a negative response. Thanks again. You’re welcome to link to EQ2Wire from your guild site! Most of the referrers to the Adornments Calculator are from raid guild websites. Legally, nobody can stop you from linking to another website. Absolutely. And I will link it once you’ve completed it. Dziękujemy! Drunder fighter armor seems to been hit with a small nerfbat in the gu61 patch. 126 sta on the items instead of the old 141.
big deal you need raid gear to get into these zones in the first place, so it becomes just asinine to even try the zones without raiding first. Too many are just getting left behind because they can’t raid. On my server there is 0 guilds looking for a brigand which is what I play and now I’m stuck in a rut and can’t progress forward unless i roll another toon deck it out with gear and learn that one. Why can’t we have an LDoN here where you get raid comparable gear for just doing instances over and over. Instead I still have to just grin and bear not getting any gears for my main and just sitting there maining up alts its getting old and boring too quick.